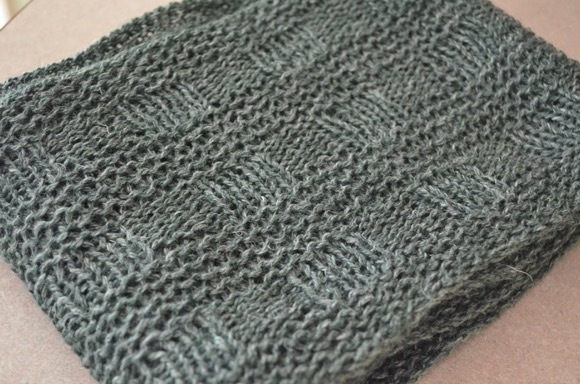 Another project is off the needles and around my neck, just in time too. The weather is gearing up to be possibly snowy. However, right now the snowflakes are intermittent. We are supposed to get 3-6 inches but I'm skeptical. I bought this skein of wool from the Gurdy run farm vendor at a fiber festival last year while my sister was visiting. 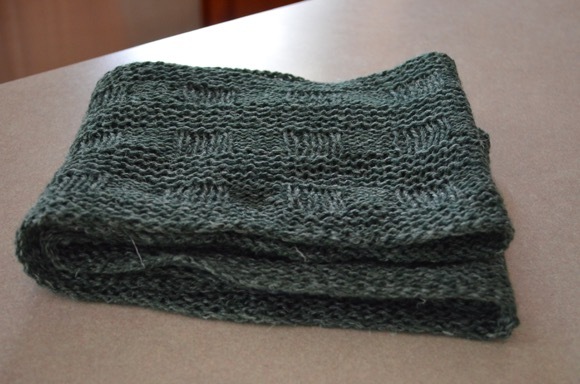 I knew when I bought the yarn I was going to make this cowl. My knitting process is buy a yarn or skeins of yarn, then find a pattern to go with that purchase. Rarely do I find a pattern then shop for the yarn. If I'm shopping, it's through my built up stash. During the soaking and gentle blocking, this wool blend blooms and softens. Sometimes, the blocking process is my favorite part of the knitting project. I have many many projects on the needles and cannot wait to share them with you in the coming days. What are you knitting or crafting these days? 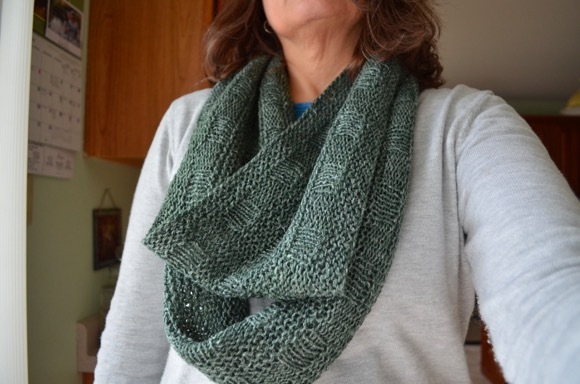 I love this pattern and yarn combo - you really made a great match with them! After reading here last Wednesday and seeing /hearing about the multiple projects you had going I started a second baby afghan. The ripple stitch takes a bit more concentration and I was looking for something I could do while we watch a DVD. The second baby afghan is in pink and a shell stitch. I've made so many of these that I could almost do the pattern in my sleep. It works up a lot quicker! I'm sorry, Karen. I answered your question and then forgot to tell you how beautiful your cowl is. Love the color! So lovely and drapey! Great finish. Very nice Karen! :) As always I can't wait to see more of your work! I love the color, it's so soothing! I am just about to start your Balancing Act Cowl. I love the yarn I chose for it and look forward to casting on the needles. We're getting 12+ inches here in CT! It looks stunning, perfect for the Spring. Here's hoping you don't get the predicted snow. beautiful cowl..well just finished a few knitted things..now going to start on some knitted squares for another blankie..have a wonderful thursday.. I hope you have a lovely week Lulu! 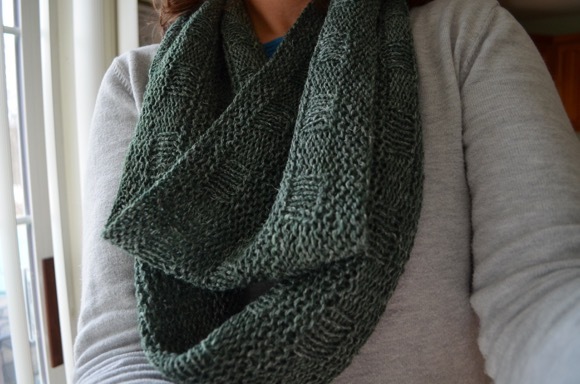 Wonderful cowl! I love the rustic look of the yarn and that color... It's not gray, it's not green... It's just beautiful! Gosh, your needles have been very busy! Love this shawl and see that I have that pattern already somewhere. You are inspiring me to be a better stash shopper! Your cowl is beautiful. I'm still quilting, making my way through a stash of material a friend gave me. Great finish on this cowl. Its colorway reminds me of Stormy Sky, one of my Distress Ink cube. I'm working on a baby beanie and I haven't touched my Harry socks for days now. The cowl looks just perfect. Such a pretty color and it looks like the right size - not too small, not too tall, not too long, but just right. It is always interesting to hear which comes first - yarn or pattern. I am following your lead and knitting a Kindness Shawl. I also cast on a pair of Hermione's Everyday Socks in a spring color way. cannot wait to see what yarn you picked for the kindness shawl! Gorgeous combination of yarn and pattern. Love it! Stay warm...I've heard reports of another storm in a few days??? This is beautiful, Karen, and I love the color. That yarn and pattern combo look as though made for each other. Then again you do have a knack for that. Your cowl is beautiful!